– They are not waterproof. They do not have PUL/TPU backing, hence it will get wet. – They give baby’s bum some “air time”. 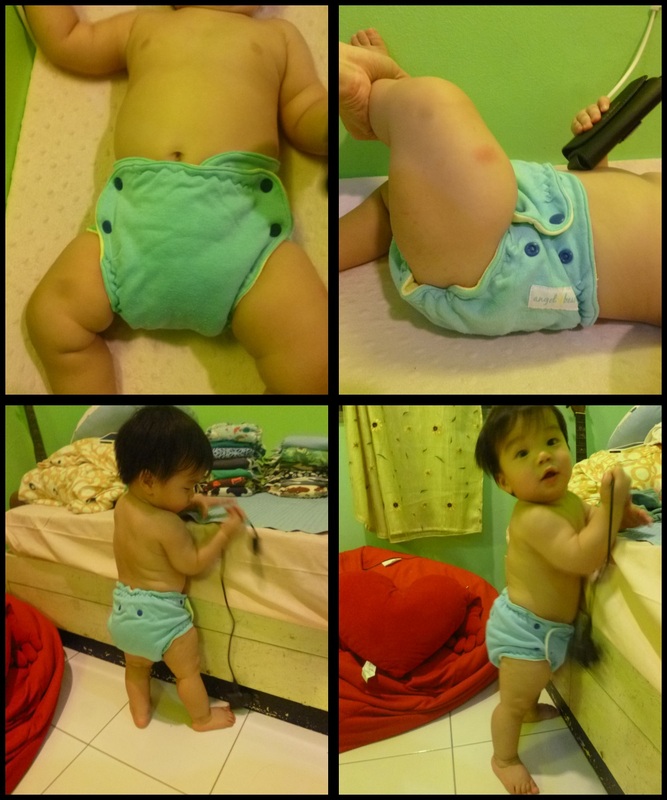 When you wear a diaper with waterproof layer, often it gets warm and baby’s bottom does not get air. This is especially important if your baby has sensitive skin. Fitteds are very good on babies with sensitive skin because their bum is “breathable” and there is no moisture trapped. – Fitted diapers are mostly one sized. You can fold down the top to expose the smaller set of rise snaps or they have the normal rise snap settings as normal cloth diapers. – They are more expensive than other diapers because of the material being used. This diaper is made of bamboo and cotton. What I like: It is very absorbent. The whole diaper is literally bamboo/cotton so it is very comfortable against Leo’s skin. The cutting is pretty generous and covers a large part of his bottom. I had no leaks or blowouts in this diaper. I see this diaper fitting him for a long time. It may not fit a 1-3 month old, but will fit from 4-5 months until toddler. This diaper is 100% cotton outer and very soft bamboo inner. What I like: This diaper does not have any soaker to snap in or additional layers. It is like an AIO and very easy to use. The inner bamboo is super soft and I wouldn’t mind having that against my skin! Leo fit in it very well and I had no leaks/blowouts too. As you can see, the leg gussets works great around the legs and it will fit Leo for a long time. What bugs me: This diaper gets wet very quickly and I believe that the absorbency is only for medium wetters. The AIO style without any snake/tongue style soaker makes drying time longer. I heard that this diaper is handmade and it is very well done. I am not quite sure what is the material used, but it is very soft and very similar to the Good Mama. What I like: The absorbency of this diaper is great. As a fitted, I haven’t felt any wetness from it even after having it on Leo for 2-3 hours. It fits really well as a OS fitted too! It has rise snaps at the front and you can also chose to fold down the front to expose the smaller set of snap closures. What bugs me: At the beginning, I struggle with the fit and found it kinda weird. Because there are rise snaps AND front rise adjustments, it makes the top part of the diaper really thin and exposing too much of the thighs. You really have to experiment on the GBW to really get the perfect fit. A diaper that is comparable to the GBW. Very similar material and very well made. The Good Mama diaper is very well-known in the USA and it is handmade by other mamas. Most of the prints are limited edition and they are very expensive. They are also mostly fitteds. What I like: This diaper is pretty trim and fits great! The soakers are very absorbent and soft to the skin. I love the prints that this diaper has to offer (which is endless!!!) and they are very high quality. I have had no blowouts or leaks and the elastics on this diaper is great. What bugs me: The only thing that bugs me about Good Mamas is the price. New ones can range from US$40-50! Other than this, it is one of the best fitted diapers. Eli Monster is a WAHM (Work at home mom) made diaper. The one I have here is cotton outer and inner fabric same as GBW/GM above. What I like: The fit of this diaper is trim and it is one of my favorite fitteds. It is absorbent and I have had no leaks/blowouts as well. I will definitely get more of this fitted if I have the chance. I think it is not as expensive as the Good Mama. They dry very quickly too. What bugs me: I think Leo will not fit in it as long as I wanted him to. It is more to the smaller cut (just like Itti Bitti). However, as a OS, it will definitely fit a smaller baby up to 18 months maybe. This is a WAHM (Work at home mom) made diaper. It is sized and has side snaps. What I like: This diaper is very well made and the material is pretty soft. The gussets work really well and I have no problems with it at all. The way it is made, I believe you can easily stuff more layers of absorbency in it to let it last longer before the next change. What bugs me: Leo is wearing this in size M. When I first got it, the seller wasn’t sure if Leo can fit in it because he is around 9.5kg. Currently he still fits it well and still has space for more growth. This diaper has a very large cut and that is the reason it being pretty big/bulky on Leo. When he’s older he will probably fit it better. Overall review: Fitteds are not my favorite diapers. They work really great and have its benefits. If you are looking for a more natural feel/natural material on baby’s bum, fitteds are the way to go! So, have you tried fitteds? And what do you think of them?